Futons are fantastic in theory. Something that optimizes space, saves money by functioning as two pieces of furniture in one product, and even offers guests a place to sleep? What a concept! Of course, execution is different from theory, and while many high-quality futons are made and manufactured, there as just as many entry level products that struggle to live up to the furniture’s promise even after a couple quick months. Entry-level futons usually include a basic cushioning pad that is stuffed with loose fiber filling. At first, it feels soft and plush, but as time goes on and it gets used more, this kind of stuffing, when used alone, can flatten and bunch up, leaving an uncomfortable surface for either sitting or sleeping, with each rung of the frame being noticeable. It doesn’t make sense to offer one product, in an attempt to do the job of two, when it wouldn’t come close to the quality or performance of the standalone products it’s attempting to emulate. If you need another evaluation of the included-with-purchase futon pads most people have, take a look at a dumpster near any college campus; you’ll more than likely see one poking out. Would you consider sitting on a couch outfitted with a 2″, fiber-stuffed cushion, rather than the strong, comfort foam cushions you’re used to? You probably wouldn’t. What it comes down to is that there’s no reason for someone to sacrifice basic comforts, just because they’re trying to make the most of what they have to work with, or stretch a dollar a little. Because of this, after years of making custom futon pad replacements for customers who were unsatisfied with their included cushions, The Foam Factory has introduced their own line of foam futon mattress cushions as a standard product, currently available online, or for in-store pick-up. 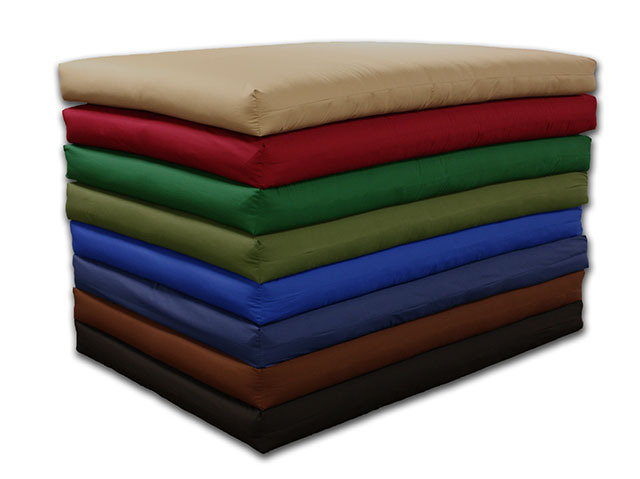 54″ wide by 75″ long, the cushion has Full-size mattress dimensions with a 6″ thickness and a variety of twill and suede covering options! The Foam Factory builds our futon pads with a 4-step process. To start, the core is made of two sections of HD36 High Quality foam, one for the seat back, and one for the seat, when used in an upright position. HD36 High Quality foam is a medium-feel material, providing an even balance of comfort and support with its 35LB ILD. Its 2.8LB density, meanwhile, is the highest offered among our comfort foams, providing extra longevity and durability. The decision to use a dual-core setup stems from the fact solid pieces of foam will initially resist folding, and once they do, the crease will eventually wear down and become uncomfortable over time. The second step is wrapping each of the two foam cores individually with 1″ Dacron polyester fiberfill. This creates a soft and fluffy cushioning layer atop the solid foam without diminishing support. After that, we wrap the cushions in fiberfill a second time, but as one large piece for this pass, giving the cushions both an individual wrapping and one together as well. At this point, we have a 4″ foam core with two layers of 1″ fiberfill wrapping the cushion. The final step is stuffing this pad into one of our suede or twill covers. With all that fiberfill, these futon mattresses come out looking fluffy and bursting at the seams – something your original futon pad probably never did! Better materials make for a better experience. Not many people would consider using entry-level futon pads outside of a dorm room. But with The Foam Factory making a high-quality cushion option available, futons are now suddenly back in vogue!